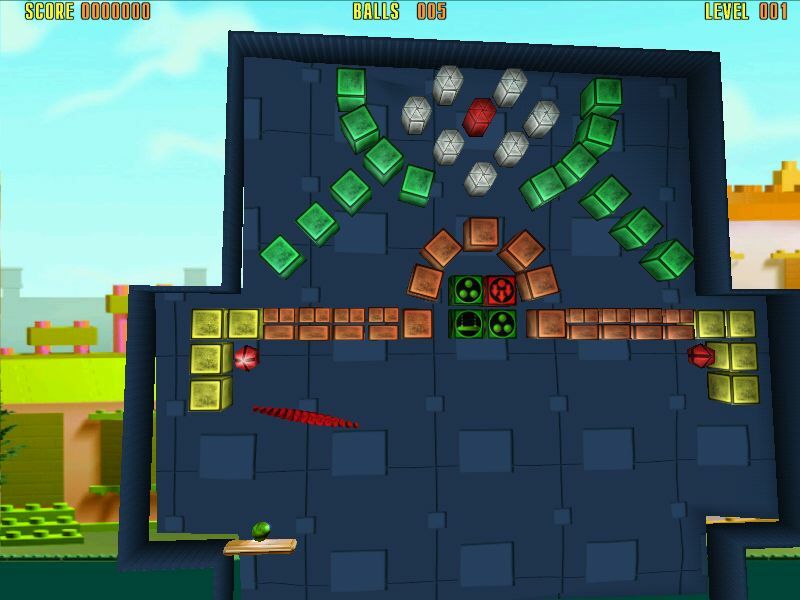 This is an Arkanoid-style game with 3D accelerated graphics and dynamic lighting. 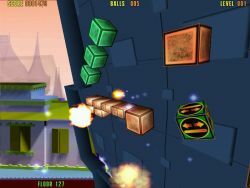 It includes teleporters, pinball bumpers, creatures that glide across the screen and colorful backgrounds. Collect powerups like fast ball, multi-ball, rockets, bullets and protective barriers. A bumper rains powerups when it's hit, and the board tilts and bobbles depending on the paddle's position. 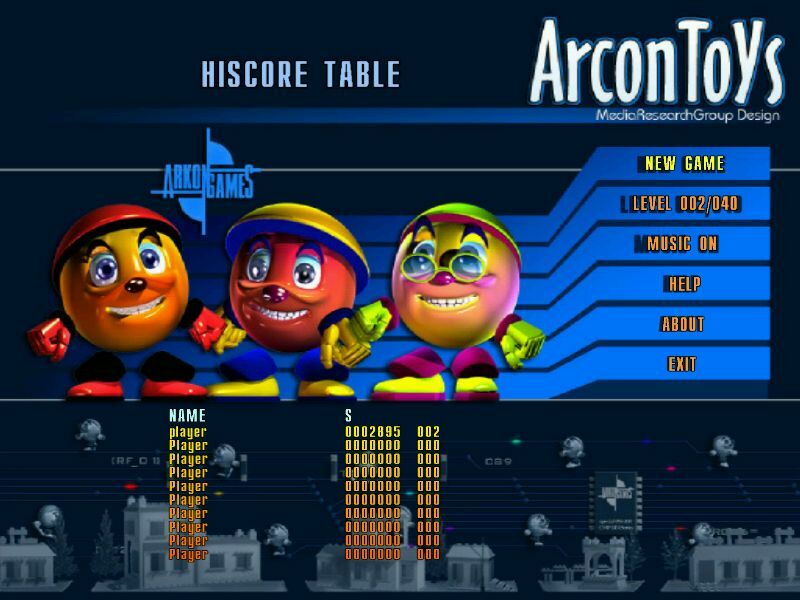 ArconToys was available as a giveaway on February 20, 2008! 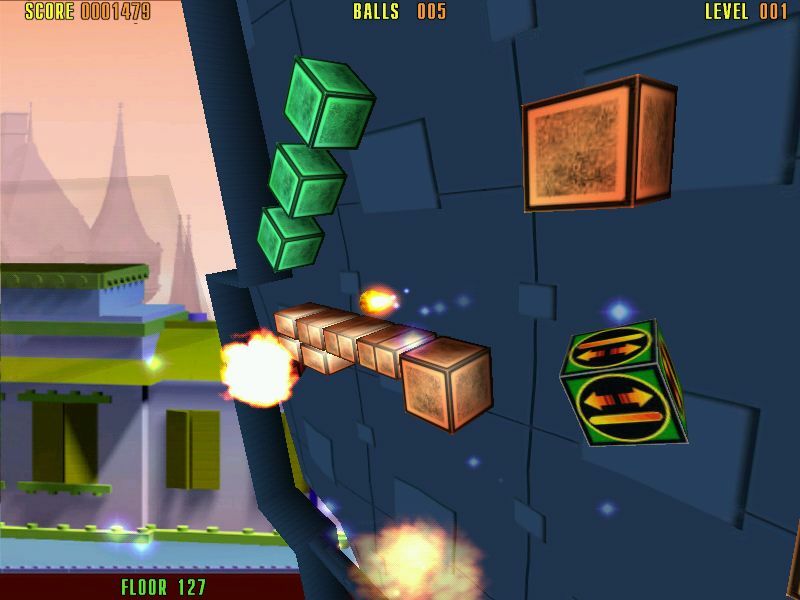 This is an Arkanoid-style game with 3D accelerated graphics and dynamic lighting. It includes teleporters, pinball bumpers, creatures that glide across the screen and colorful backgrounds. Collect powerups like fast ball, multi-ball, rockets, bullets and protective barriers. A bumper rains powerups when it's hit, and the board tilts and bobbles depending on the paddle's position. i like getting games here....but, i always wonder about the software developers that don't connect to their own site. i like being able to go to a companies homepage and check them out and see if they have more detailed info about the game. I love ballbreaker games but this one is not very interesting. Some new bonuses but that's all. Perhaps the next will be better. Hello. I love ballbreaker games but this one is not very interesting. Some new bonuses but that's all. Perhaps the next will be better. But thanks GAOTD. Memory access failure in Windows Vista Business. Did not load into all programs had to fish it out of the C: drive folder, under games, a new folder I believe. Did simply delete, I think. Also, can't see what objects are falling when zoomed in on the ball. Makes me want to throw up! Also, can't see what objects are falling when zoomed in on the ball. Thumbs down! I get the MAV error as well. It really shocks me that this giveaway has been available for over 20 hours (with substantial response) and the authors, who hope this will give their software positive exposure, have not made a single helpful comment. From a marketing perspective, the authors have failed completely. Maybe ggaotd should try installing their prospective software items on a couple of computers prior to putting them up for the world to download. Fatal for game author . . . Black eye for ggaotd. I get the MAV error as well. It really shocks me that this giveaway has been available for over 20 hours (with substantial response) and the authors, who hope this will give their software positive exposure, have not made a single helpful comment. From a marketing perspective, the authors have failed completely. Maybe ggaotd should try installing their prospective software items on a couple of computers prior to putting them up for the world to download. Fatal for game author . . . Black eye for ggaotd. 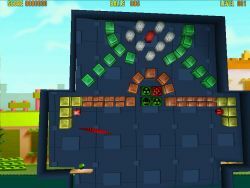 For an Arkanoid-style game and at $4.95 it is passable. It runs fine on my windows xp sp2 but it's a game that I would only play when I have nothing else to do. Maybe a couple of times a week. It downloaded and activated just fine and would be really great for children under the age of 13. I was bored after level 2 but will keep it for awhile to play with occasionally. "memory violation error" on XP SP2, and its not enough to add the game executable to the DEP exception list. my guess is it will only run if DEP is completely disabled on XP. "memory violation error" on XP SP2, and its not enough to add the game executable to the DEP exception list. my guess is it will only run if DEP is completely disabled on XP. An amusing little game from early 2003, a sequel of sorts to 3D Bricker (same author). Worked fine in Win98, but I received memory access violations in Vista - despite trying the suggestions listed above. Anyways, I do enjoy a wide variety of games, breakout-types, platforms, shmups, thinking, match-3, hidden object, etc, so no complaints there. Regarding the game, the graphics were probably not the best possible, however I think they were great. The sound seemed a little bit out of place for the type of game, as some of the levels seemed to have more mellow music. The concept, as has been said, is your typical breakout game, you have a paddle, which can collect powerups/powerdowns, a ball bounces off of it, and you have to clear all of the "bricks" in the level. Someone mentioned earlier there are only three level shapes, but this is incorrect. I have unlocked a few more, so I believe as you progress, that is how you unlock them. One thing this game does, that a lot do not do, is that the actual level "sways" back and forth left and right across the screen, and there is a powerup that puts a "floor" in, so the ball can not escape, and the whole level rotates 360 degrees, as it follows the ball around. This does not affect the ways the balls bounce, only a visual appearance issue. This does not bother me at all, as I love breakout games, and there is supposed to be a lot of things moving around the screen at the same time. The controls are responsive, and worked well, without being too sensitive. I only have one complaint about it, and that is that the powerups to me are very difficult to differentiate. The "good" ones are green, and the "bad" ones are red, however they are all still the same shape and size. They are all in the shape of a spinning cube, so as you are playing, it is really hard to tell which one you are getting. I don't like this, because one of the powerups is the one that gives you the floor I mentioned. I like being able to not lose the ball, but when I play games, I am a perfectionist, and it is a lot harder to catch all the powerups, when you can not see the paddle. Have tried unsuccessfully to get past MAV error message...on my WINXP-SP2. Tried changing the Control Panel Settings as per #40 and tried #43's solution....no luck. Will uninstall and come back again tomorrow!! Please bring back KeyWords as I loved it but somehow messed up and uninstalled it...or something similar! MAV ERRORS. NO COMMENT FROM THE MAKERS???? Thanks for another free game today - Yes, these charactors do look like the volleyball game from a few days ago. Since I get motion sick easy, I am passing on this one - moving board and sickness are not fun for me. If the board would stay still or moved very little, I would love to try this game. I am passing today, but thank you! I think these memory violations are due to DEP protectoin arn't they? You can turn it off see how here. A further thought... Perhaps my 512M installed memory is insufficient for these games? I can not be the only one with a low end Walmart/HP special. I like you guys/gals and the service you provide. The exposure to software I might otherwise never see is precious to me. Thank you. Check into it, get back to me. Your ticker is listed with me on MySpace. As with a multitude of the free game downloads, it does not work. An unrecoverable memory error occurs instead. I have five different browsers with which to make the attempt - all failed. The suppliers have missed a few opportunities for future sales simply because what they have offered through you did not work for me. Judging from the posts, not everyone has issues with this and other offers. Clue me, I am a social commentator with a high regard for "GiveAway" and blog posts pending for some FINE software provided by these two sites. The companion site has never had an issue, except when I get so busy I forget to launch prior to expire :( Check into it, get back to me. Your ticker is listed with me on MySpace. I cant download the game. I tried both the links but when I go to "wikisend" and click "download" my browser says "the page cant be displayed". I cant download the game. I tried both the links but when I go to "wikisend" and click "download" my browser says "the page cant be displayed". I'm using IE 6. Will not even run for most ppl here. Why are you putting these useless 'games' up lately? Will not even run for most ppl here. Why are you putting these useless 'games' up lately? Nice attempt at a new spin on the brick breaker genre but doesn't really work IMO, especially as the actal brick breaking itself isn't all that special. So a thumbs down from me. I tried solution #40 but still get "memory violation error" - just like #45. Can anybody help? I have to say, for a brick-buster, this one is really nice. The unique bonuses help. Nice game! Downloaded fine on XP. Great to play, and I was able to play due to all the help with short cuts the other day! 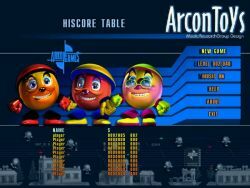 I am huge fAN OF ARKANOID games, I love them! Thank again GGAOTD for another great game and different one as well! I'll play a bit longer but I have to ready for my leg prosthetics, that will be nice as well! HAVE A SUPER DAY ALL! YOU TO GGAOTD! I found this game pretty good. The one thing that stressed me is audio. Music theme is very annoying and ingame sounds are pretty lame for me. The only problem I had with this game was the view that was constantly changing (was giving me a headache) It'd be great if you had a button where you could just make the game stay still. Since there isn't I decided to delete this game. I also receive a “memory access violation” error when I attempt to play the game. Not worth trying to get it to run. Uninstalled. Says error, memory violation. can’t play it. what is the solution? Wtf it's published with bugs ? Wow, I usually like brick shooters but I'm not sure about this one. It's different, I'll say that. I sure don't like the cube that sets the board swirling in all directions. I like to have control of the game but when that happens all you can do is wait for it to come back to normal, so it's like you're not really playing....just watching. Also the ball does a lot of going left to right so again, all you can do is sit and watch the game do it's own thing. I'll try it a bit longer but I don't give it much hope right now.....very low score. Wow! Thank You so very much. Two days in a row, games I adore. My first post because I am so happy to have found your site! I went to documents and settings and made a new file, named it and finished install. Opened up Documents and Settings, found it and double clicked on the game icon and it worked great! Also, I right clicked on the game file icon and sent it to my desktop, now I have a shortcut on my desktop. That is the extent of my limited computer knowledge, so glad it worked. The game does get a bit dizzying with one of the power-ups, lost all my balls in about 1 second. Must say I was smiling the whloe time though. It is a unique game and I also hope to find more levels, perhaps someone will get lucky and find them. If not, as they say, you can't have everything, where would you put it? Thank you GGOTD and Whiterabbit for mentioning it yesterday. Ta Ta For Now. Wow! Thank You so very much. Two days in a row, games I adore. My first post because I am so happy to have found your site! I went to documents and settings and made a new file, named it and finished install. Opened up Documents and Settings, found it and double clicked on the game icon and it worked great! Also, I right clicked on the game file icon and sent it to my desktop, now I have a shortcut on my desktop. That is the extent of my limited computer knowledge, so glad it worked. The game does get a bit dizzying with one of the power-ups, lost all my balls in about 1 second. Must say I was smiling the whloe time though. It is a unique game and I also hope to find more levels, perhaps someone will get lucky and find them. If not, as they say, you can't have everything, where would you put it? Thank you GGOTD and Whiterabbit for mentioning it yesterday. Ta Ta For Now. Game installed fine for me and installed in the location I chose. Went in and sent it to the desktop to create the shortcut there. I use Windows XP Home, SP2. I had no problem running the game, no errors like a lot of people are getting. The game is kind of fun, takes getting used to the wobbly board. This is the first break-out type game I have seen where the gameplay area itself was in different shapes, which makes this game unique and interesting. A different shape for every level. It does have only 2 or 3 different backgrounds so you see the same ones every couple levels, but they look ok. The music is ok, but kind of a sickly dizzy tune that really kind of fits the game. Game installed fine for me and installed in the location I chose. Went in and sent it to the desktop to create the shortcut there. I use Windows XP Home, SP2. I had no problem running the game, no errors like a lot of people are getting. The game is kind of fun, takes getting used to the wobbly board. This is the first break-out type game I have seen where the gameplay area itself was in different shapes, which makes this game unique and interesting. A different shape for every level. It does have only 2 or 3 different backgrounds so you see the same ones every couple levels, but they look ok. The music is ok, but kind of a sickly dizzy tune that really kind of fits the game. I'd say this is one of the best games offered at this site. I will keep this game handy for when I get bored, which is not often...LOL Thanks GGOTD. Solution for the "Memory Access violation". To fix the "memory access error", click on Start, Control Panel, System, Advanced, under Performance, click on Settings, Data Execution Prevention, click the lower radio button, then add the name of the .exe file name for this program (game), or any other program that get the MAV error. Solution for the "Memory Access violation". To fix the "memory access error", click on Start, Control Panel, System, Advanced, under Performance, click on Settings, Data Execution Prevention, click the lower radio button, then add the name of the .exe file name for this program (game), or any other program that get the MAV error. Well, I guess you can't really express your opinion here without it getting deleted. Let me try in the kindest way I can so as to craddle the feelings of all the sensative people on here. #31, since you know so much and we know so little, could you shed a little light on the solution for us? I know we are not worthy of your vast knowledge but could you please elaberate on a way to make this work? Oh thank you kind sir, you are a virtual god. Geez...is that good enough or will this be cencored as well, so much for freedom of speech! Not a bad Arcanoid clone on my Windows XP sp3 machine. I've bought and downloaded alot better, but for the price it really is a good game. Worth the download IMO. Suki, I posted a link to Windows XP SP3 over on the forums for ya as you requested yesterday. Hope it helps! Well, I've tried #31, #32 AND #33 suggestions and STILL get memory access violation. Any ideas? Just thought I'd let you know that I was a bit put-off this morning of downloading because of so many bad comments. However, downloaded half an hour ago and found no problems whatsoever. Game is in c/games folder and works perfectly. It's a nice little game with lots of powerups and a background sort of like lego! Don't be put off its worth downloading because obviously not everyone is having memory problems. Thanks a lot. Does run fine on Windows ME. But not Vista, just displaying "Memory Access Violation" even with setting to "compatibilty Win 95"
Does run fine on Windows ME. But not Vista, just displaying "Memory Access Violation" even with setting to "compatibilty Win 95"
#31, could you please explain the solution. I am getting the error but have no idea how to "enable the exe file." Thanks! ATTENTION those having trouble with this game running...I also have xp home edition...when installing the game use the (browse) button and install somewhere other than C docs and settings...I think if you try this the game will work fine. Oh, if already installed in 'c' delete and REINSTALL; do not move. Hope this helps. I think you will find worth installing. A bit different from usual arcade/pinball type games. Thank you GGOTD and Flygames. ATTENTION those having trouble with this game running...I also have xp home edition...when installing the game use the (browse) button and install somewhere other than C docs and settings...I think if you try this the game will work fine. Oh, if already installed in 'c' delete and REINSTALL; do not move. Hope this helps. I think you will find worth installing. A bit different from usual arcade/pinball type games. Thank you GGOTD and Flygames. As with a previous offering, I find that if you set the compatibilty with WIN 95, this game should run. I see people blaming the programmer for the "memory access error", it is not the program, it is the USER. You have enable the exe file that executes the game. Look for it, it is there! If you cant find the solution, I will get back on here later and tell you, unless someone else wants to. Pretty good game. Geared more towards kids, so I will keep it for them to play. Got the "Memory Access Violation" too. It is any easy fix, through Win-XP Control Panel. You have to list the game's .exe filename so Windows will run it. OMG! I had no idea whatsoever that playing a computer game could cause motion sickness. I've been playing 3D games for years, but never ever have I experienced nausea from playing one before (*_*) Is totally true what #12 said. On the plus side, this is certainly a very original and quite novel game, I've never seen brick busting game even remotely like this one, so big thumbs up to the programmer. Unusually, it plays the same music as the Volleyball game that was on offer here a few days ago, and the characters on the title screen are the same too. OMG! I had no idea whatsoever that playing a computer game could cause motion sickness. I've been playing 3D games for years, but never ever have I experienced nausea from playing one before (*_*) Is totally true what #12 said. On the plus side, this is certainly a very original and quite novel game, I've never seen brick busting game even remotely like this one, so big thumbs up to the programmer. Unusually, it plays the same music as the Volleyball game that was on offer here a few days ago, and the characters on the title screen are the same too. Same thing here, Memory Access Violation! I'm running Windows XP Media Center Edition. Same thing here, Memory Access Violation! I'm running Windows XP Media Center Edition. Nice start up screen, jolly music, that's as far as it goes - it's gone! exactly the same problem here. Previously, I've downloaded and installed maybe 30-40 games & apps from the 2 giveaway sites over these last 10 months, and never had a single problem. Today's seems OK at first, despite the antiquated installer - animated splash screen launches, then I get the memory error. XP Pro-SP2, 2gb RAM, Dell laptop; I'm the only user, and have full access rights. exactly the same problem here. Previously, I've downloaded and installed maybe 30-40 games &amp; apps from the 2 giveaway sites over these last 10 months, and never had a single problem. Today's seems OK at first, despite the antiquated installer - animated splash screen launches, then I get the memory error. XP Pro-SP2, 2gb RAM, Dell laptop; I'm the only user, and have full access rights. I can comment on uninstalling if you don't like it. It's not so much uninstall but click on C:/Games and delete the folder from there. It's very rare a GGAOTD does'nt run on my PC so I have to comment on bad programming, I'd guess at the game not supporting the most computer configurations, Lets face it though....There's a heck of a lot of home-built PC's around as well as shop built! Same as a lot of people here, I installed the game but on running got a *Memory access Violation* so sadly can't comment on how the game looks or runs :-( I can comment on uninstalling if you don't like it. It's not so much uninstall but click on C:/Games and delete the folder from there. It's very rare a GGAOTD does'nt run on my PC so I have to comment on bad programming, I'd guess at the game not supporting the most computer configurations, Lets face it though....There's a heck of a lot of home-built PC's around as well as shop built!